From the Editor: In the National Federation of the Blind, it is almost a cliché to say that conventions change lives. However, this phrase is heard so often because it rings true for hundreds of blind people and their families each year. In this article, Michelle Murrey describes the effects of her family’s first convention experiences. In 2016 my daughter, Mikaela, and I attended our first national convention of the NFB. Mikaela was only a year old at the time, and participating in the NFB community was a very new experience for both of us. Though we learned a lot, convention was a bit overwhelming, as there was so much to take in over the course of the week. When we had the opportunity to return to national convention this year, I was thrilled. I was excited to reconnect with people we met last year and to expand my knowledge about raising my daughter to be a confident and capable person. I expected to attend meetings, learn about the IEP process, and hear inspiring stories from NFB members in the general sessions. I was eager to connect with blind adults and with other families who are raising blind children. I love to learn from blind adults, as they offer a perspective into my daughter’s world that I cannot fully understand as a sighted person. What I did not anticipate was the profound impact the convention would have on Mikaela. During the course of convention week, I witnessed my two-year-old undergoing a transformation. Suddenly she was more willing to travel with her cane independently. She insisted that she walk by herself from our room down the long hallway, down the staircase, through the lobby to another staircase, and out the doors to the pool. I proudly walked behind her, offering verbal cues only as needed. She led the way, cane in hand. Mikaela played in the pool and jumped on the bed like a monkey with other toddlers. 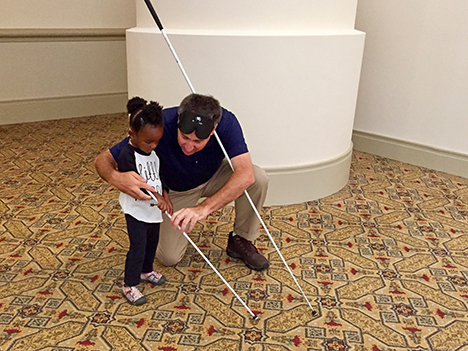 Some of them also have prosthetic eyes, and some have parents who use long white canes—just like Mikaela. She listened to stories being read from a book written in Braille. From the first Federation event I attended, I have known that the NFB was going to play a key role in my life as a parent raising a child who is blind. But it wasn’t until this past summer, when I witnessed the transformation in Mikaela, that I realized the profound impact growing up in the NFB would have on her life. From her earliest memories, she will be able to recall positive role models—people who are living the lives they want. I hope that the NFB will inspire her to do the same. What Does The TEACH Act Mean To The Blind IN 2014?